You didn't think Samsung was going to get all the fun were you? After the announcement at Google I/O where Hugo Barra unveiled a Samsung Galaxy S4 running Stock Android (Nexus User Experience), people instantly wondered if the well received HTC One was going to get the same treatment. After weeks of rumors, the Nexus User Experience HTC One is a reality. As with the Nexus User Experience Samsung Galaxy S4, the Nexus User Experience HTC One will only be available in the U.S. on Google Play and for a slightly cheaper price of $599. HTC does imply that they are hoping to offer this outside the U.S. so there might be hope for Canadians. There is also some interesting tidbits that were confided to The Verge. 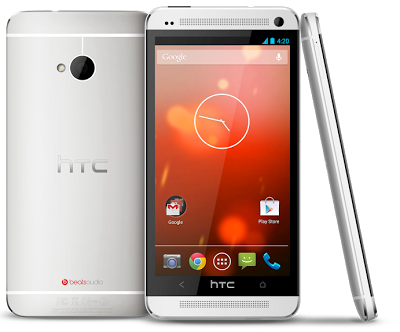 HTC is looking into ways to accommodate early adopters, which implies there might be a way to flash a full stock ROM on already owned HTC Ones. Whether this involves non-Developer edition HTC Ones remains to be seen. Also, there are a few downsides to the all stock experience including the loss of the IR blasters, Zoes + other camera features and Blinkfeed. What does remain is the hardware audio Beats enhancement, although it's unclear whether users can toggle Beats on and off. The button layout and behaviors will remain the same as the regular HTC One's. long press home for Google Now, double tap for multitasking and sadly the ugly menu bar for legacy apps. Check out our review of the HTC One.